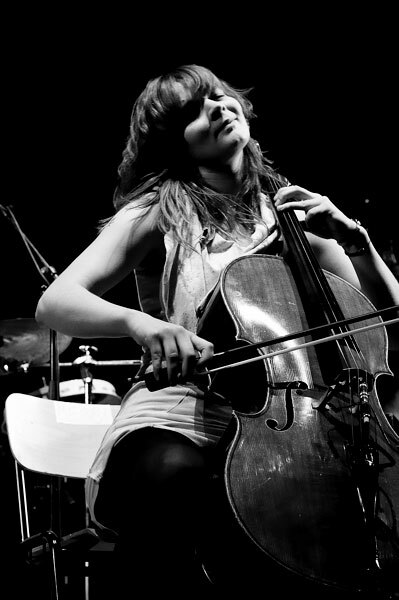 Hildur Ingveldardóttir Guðnadóttir, born 1982), is a cellist and composer. Best known for her collaborations with Mum and guest appearances with Pan Sonic, she has a rich catalogue of collaborations and varied projects behind her.Guðnadóttir began playing cello as a child, entered the Reykjavík Music Academy and then moved on to musical studies/composition and new media at the Icelan Academy of the Arts and Universitat der Kunste in Berlin. Back in Iceland, she became very active in the nu-Iceland scene as a member of Kitchen Motors, a Reykjavík based think tank, record label and an art collective along with internationally renowned composer Johann Johannsson. In 2004, Guðnadóttir played a few gigs with Angel, including clubtransmediale 2005. She made an album with Schneider TM, and went on to play live PanSonic, later collaborating on their album Cathodephase.She released her first solo album, Mount A, under artist name Lost in the Hilderness, on the Reykjavík based label12 Tónar in 2006. The album was recorded in New York City, and at ‘Hólar in Hjaltadalur’, a historic spot in Iceland with a house named Auðunarstofa. The old house is constructed from Norwegian wood and was chosen for its excellent cello acoustics. Guðnadóttir played all the instruments on the album – vibraphone, viola da gamba, harp and vocals.Guðnadóttir is a member of Storsveit Nix Noltes (The Nix Noltes Big Band), a rotating cast of 7 to 10 Icelanders playing traditional Bulgarian and Greek dance music. The group has toured the US twice supporting Animal Collective. She has also played frequently with field recording artist and performer BJ Nilsen; delicate duets that conjure somber rapture of multi tracked cello – Guðnadóttir’s live playing augmented by laptop loops. Guðnadóttir has collaborated, played and recorded with other artists such as Skull Sverrisson, Hilmar Jensson, Hafler trio, Jóhann Jóhannsson, Nico Muhly, Valgeir Sigurdsson, Angel, SchneiderTM, Ben Frost and Stilluppsteypa. As a composer she has written music for plays, dance performances and films, pieces for chamber orchestras, various instruments, voices and electronics. She recently wrote a score for the play Sumardagur (Summer Day) performed at Iceland’s National Theatre. Guðnadóttir has made sound and visual installations and has also assisted other artists such as Christina Kubisch with realizing and setting up sound installations. She recently co-composed a live soundtrack to Derek Jarman’s 1980 film In The Shadow of The Sun with legends Throbbing Gristle, arranged choir for performances by them in Austria and London.